℗ 1985 Original sound recordings made by EMI Records Ltd © 1985 EMI Records Ltd. 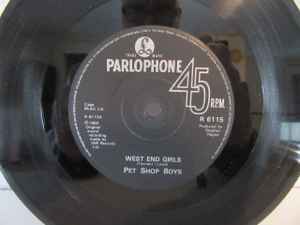 This 7" also came as a bonus disc sealed inside early pressings of the 10" collectors edition of West End Girls (Catalog# 10R 6115). Also exists an identical edition with Silver Labels. Initial copies were in a spot-varnished card sleeve.